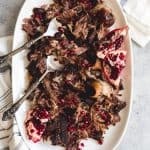 Our family does a lot of entertaining, especially around the holidays, and this Slow Roasted Lamb Shoulder with Pomegranate Apricot Glaze is a delicious roast that is perfect for festive gatherings or Sunday dinners when braised in pomegranate juice and cooked until it is fall-apart tender! Preheat oven to 325 degrees F. Combine the rub ingredients together in a small bowl and rub them all over the lamb shoulder. Place the lamb shoulder into a large pan or roasting dish, then scatter the rosemary and garlic on top. Some people like to cut gashes into their lamb and actually stick the rosemary and garlic into the lamb, but I don't find that to make much of a difference so I don't bother. Let the lamb sit out of the fridge for 1 hour before cooking. Preheat oven to 325 degrees F. Scatter the chopped onion around the meat. In a separate bowl, whisk together the pomegranate juice and apricot preserves, then pour into the pan around the lamb for a braising liquid. Cover the pan tightly with aluminum foil and roast for around 4 to 4 1/2 hours. The lamb shoulder is done when you can easily pull the meat apart with two forks. To make the glaze, at about the 3 1/2 to 4 hours mark, take roast out of the oven and remove the foil then carefully pour off the liquid into a fat separator. Pour just the lamb juices with the pomegranate juice and apricot preserves into a medium saucepan. Re-cover the meat and return to the oven. Meanwhile, bring the liquid to a boil over medium-high heat until reduced by 1/3 to 1/2 and becomes syrupy, about 20 minutes. When the lamb is done, remove it from the oven and pour half of the glaze over the meat. Use two forks to pull the tender meat away from the bones and shred in the glaze, then transfer the shredded lamb to a serving platter and scatter with pomegranate seeds for garnish. Cover and keep warm until ready to serve. Serve with the remaining glaze for guests to drizzle over their lamb, if desired.